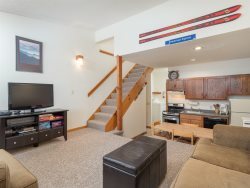 Ski-In / Ski-Out Slopeside Property Rentals | Maine Ski Lodging Co.
Centrally located above South Ridge and below Barker Mountain Lodge, Cascades Condominiums is one of the most conveniently located ski-in / ski-out condo complexes at Sunday River. Cascades offers easy, direct access to Broadway trail leading to the South Ridge base area which is home to several restaurants, food courts, equipment rentals, retail options and ski lessons. Cascades offers easy access to the Chondola and Sunday River Express lifts in the South Ridge base area. The Chondola services night skiing in the winter and during the summer months offers scenic chairlift rides, hiking, geocaching adventures and mountain biking. Centrally located just below Barker Mountain Lodge and above South Ridge, Sunrise Condominiums is one of the most conveniently located condo ski-in / ski-out complexes at Sunday River. Sunrise offers direct access to Broadway trail leading to the South Ridge base area which is home to several restaurants, food courts, equipment rentals, retail options and ski lessons. Sunrise offers easy access to the Chondola and Sunday River Express lifts in the South Ridge base area. The Chondola services night skiing in the winter and during the summer months offers scenic chairlift rides, hiking, geocaching adventures and mountain biking. White Cap Village offers ski-in / ski-out access and is comprised of two separate buildings featuring one and three bedroom units. Located trailside at Sunday River Resort on Road Runner trail, White Cap Village condominiums are located within close proximity to the White Cap and Barker Mountain Base Lodges where you youll find a variety of activities and dining options. Guests of White Cap Village have access to a private recreation facility with an outdoor heated pool, hot tub, sauna, locker rooms and large common room. Start your day just up from the White Cap Base Lodging at Brookside Condominiums. Brookside is located slopeside and offers ski-in/ski-out access via the Roadrunner Trail. Brookside is a convenient location and features an outdoor heated pool and large outdoor hot tub.